Springtime is strawberry season in San Diego. While just about the rest of the US is waiting until mid-June for these beauties, we get them a full two months before everyone else. Sure you can buy them at your local megamart in Wyoming in the middle of the winter, but the berries we get now are local AND ripe. With such great berries, I really didn’t need to do too much to them to make a fantastic pastry. I knew I wanted to make something light and not too complicated so I searched the web for various strawberry recipes. I stumbled on a recipe for strawberry shortcake cupcakes over at stickygooeycreamychewy.com last week and new right away that I had to make them. Strawberry shortcake is the ubiquitous strawberry dessert. 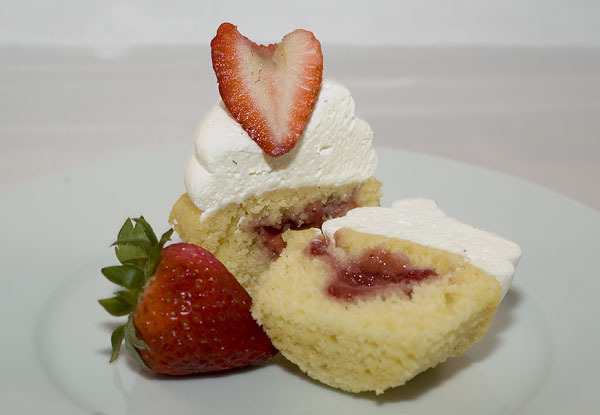 Everyone has their own favorite ‘shortcake’; shortcake, angel-food cake, pound cake, and more, but the dessert is very adaptable while still being able to be called strawberry shortcake. 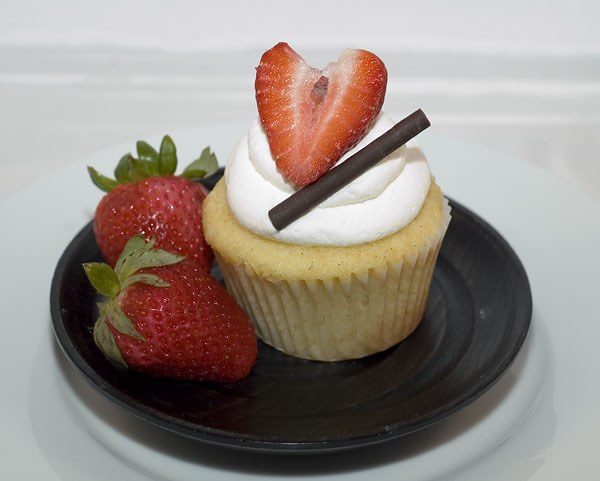 While these cupcakes probably stretch those roles to their limits, they still embody everything that is good about the dessert: a cake base, fresh strawberries, and cream. I don’t believe I made any changes to this recipe other than swapping in whipped cream instead of the strawberry marscapone frosting. I can’t take credit for anything but the execution of this recipe. I’m going to paste the recipe here, but please feel free to check out stickygooeycreamychewy.com for more info about these. Spoon about a teaspoon of strawberry gelée filling into each cupcake and top with the cone top. Divide batter evenly among liners, filling about three-quarters full. Bake, rotating pan halfway through, until a cake tester inserted in the center comes out clean, 20 to 25 minutes. Transfer to a wire rack to cool in tins for 15 minutes. Remove cupcakes from tins, and cool completely on rack. Once cupcakes have cooled, frost as desired. Heat puree and sugar in a small saucepan just until it begins to bubble, stirring to dissolve sugar. Stir in lemon juice and remove from heat. Put water in a small bowl and sprinkle gelatin on top. Let sit for 5 minutes. Add fruit puree mixture to the bowl and stir until gelatin is completely dissolved.